Yoqneam, Israel, November 8, 2018 MIND C.T.I. LTD. – (NasdaqGM:MNDO), a leading provider of convergent end-to-end prepaid/postpaid billing and customer care product based solutions for service providers as well as unified communications analytics and call accounting solutions for enterprises, today announced results for its third quarter ended September 30, 2018. The following will summarize our major achievements in the third quarter of 2018, as well as our business. 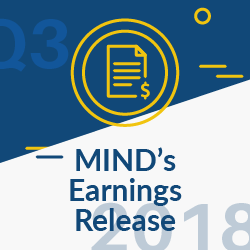 Full financial results can be found in the Company News section of our website at https://www.mindcti.com/company/news/ and in our Form 6-K.
Also as previously mentioned, on February 18, 2018 the Company received a status of “Technologic Preferred Enterprise” starting 2017 and until 2021, the impact being that income taxable in Israel will be subject to a tax rate of 7.5% as long as this status is maintained. As we previously announced, given our strong cash position and our experienced organization, we believe that we have the required resources to respond to market needs and at the same time focus on targeting potential acquisitions that could benefit the company’s growth. Our active pursuit is focused on acquisition targets at reasonable valuations that satisfy the criteria we defined: proven revenues, complementary technology or geography and expected accretion to earnings within two to three quarters.